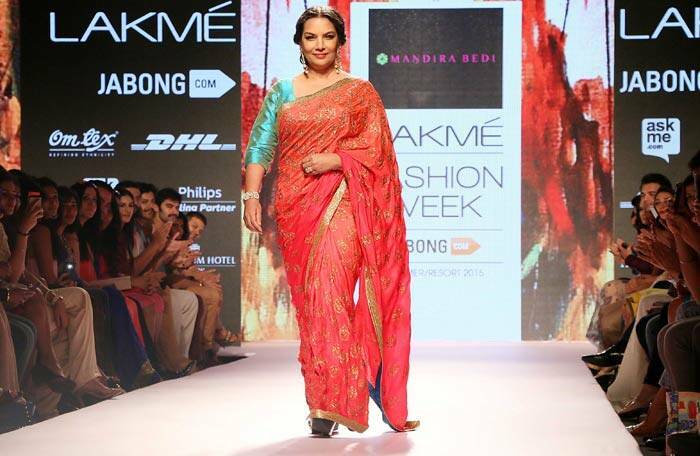 Shabana Azmi took to the ramp looking elegant in a glittering red sari with a turquoise blue blouse -- a creation by Mandira Bedi. The ever-so-graceful Shabana Azmi glided down the ramp to an audio of her husband Javed Akhtar reciting couplets from a poem at the Lakme Fashion Week summer-resort 2015 here on Sunday. The veteran actress took to the ramp looking elegant in a glittering red sari with a turquoise blue blouse — a creation by actress-designer Mandira Bedi, who added her distinct sartorial touches to India’s traditional six-yard wonder. Zeroing on the Banaras sari, woven in Varanasi, Mandira fused the ancient weaves with modern designs. She opened the show with a white and pink border, silk sari with a giant flower appliqué on the pallu. What followed were saris with luxurious gold, yellow, pink, magenta, orange assorted silk and brocade borders that appeared horizontally on the sari. Two-toned versions with solid and brocade mix were another alternative. Multi-borders appeared on net, while the tulle segment looked glamorous with varying applique options. Apart from Mandira, the opening show also witnessed Aartivijay Gupta’s line that took its inspiration from the art of mosaic glass. Her story of mosaic art revolved around nature, with images of parrots, fish, birds, houses, trees and peacocks prancing on her basic silhouettes. The designer showcased five key looks that were utterly feminine with stylish mass appeal. The sheath dress emblazoned with a parrot mosaic, skirt and tee, cape tops with pencil skirts, A-line dresses and the glass organza maxi with gold nakshi work, turned out to be winners. Another designer Kunal Anil Tanna’s line was inspired by Japanese culture. Based on traditional Japanese festivals when the plum and cherry blossoms come to life, Tanna used the techniques from that country for the tie and dye effects for airy summer voiles and textured cottons. Actor Rajkummar Rao turned up as showstopper for Tanna, and he flaunted a suit in varying shades and textures of maroon.